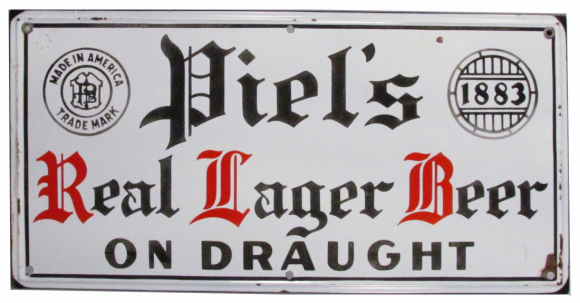 This is a rectangular Piel’s Lager Beer porcelain sign. This particular Piel’s Lager Beer sign is white with black and red text. It reads, “Piel’s Real Lager Beer On Draught, Made In America, Trade Mark, 1883” and features two black emblems in the upper left and right corners of the sign.